As you’d expect of a people whose tea culture extends back hundreds of years, the Japanese enjoy every type of cha imaginable—pungent, sweet, soft, grassy, clean and earthy. Leaves can be plucked, steamed, packed, processed (dried and rolled) and refined (stems and debris removed), or ground for matcha and roasted forhoujicha. To get the most out of your drink, here’s a guide to the ABC’s of tea. Fuka-mushicha (深蒸し茶) is steamed for 2-3 minutes when processed, hence the name, which means “deep-steamed.” On the palate, fuka-mushicha is mellow and has a round flavor. Genmaicha (玄米茶) is gorgeous to look at—bancha green tea flecked with small kernels of roasted, popped brown-rice kernels (genmai). The aroma is easy to recognize, and the flavor is soft on the palate and slightly savory. It’s also light in caffeine, making it a good tea to drink in the evenings. Gyokuro (玉露) is a delicate tea, as the bush was shaded from the harsh sunlight for about two weeks prior to harvest. This gentle product is lightly sweet on the palate and is very mellow in its aroma. Houjicha (ほうじ茶) is a blend of bancha and kukicha teas, heated to a high temperature to slightly roast it. It is known for being a good after-dinner tea, as it will help the body to digest food and is lower in caffeine than green teas. Ichibancha (一番茶), or the year’s first crop of tea, is often picked around May 1. The first harvest is considered the best, with each successive crop somewhat inferior. Also referred to as shincha. Kukicha (茎茶) is from the twigs and stems of the tea bush. It is slightly nutty and earthy, with a hint of sweetness on the palate. Matcha (抹茶) leaves have been shaded from the sunlight (like gyokuro leaves) before being steamed and dried without. The veins and the stalks are removed, and the remaining leaf is ground into a fine powder. Matcha is what’s used for the traditional tea ceremony; its powder is also sold in an instant form (like coffee) that can be used for making matcha au lait or mixing with vanilla ice cream and adding into milkshakes. The instant form is very easy to work with. Mecha (芽茶) is made from the buds and tips, and is harvested early in the season. This tea is aromatic, slightly bitter and astringent. Mugicha (麦茶) is roasted barley tea that’s popular in the summertime served cold. It has a roasty, toasty flavor and is brown in color. Sencha (煎茶) is the most popular type of tea consumed in Japan. The leaves are briefly steamed during processing, resulting in a refreshing flavor and grassy notes. Sencha pairs well with many types of sweets. 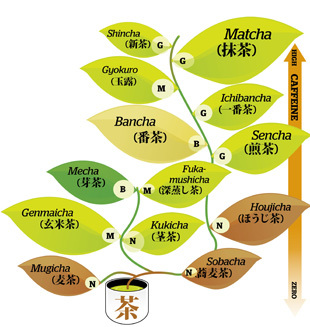 Shincha (新茶), or “new tea,” is the year’s first crop of tea; also called ichibancha. This article first appeared in Metropolis.